From its source on the Tibetan plateau, the Yangtze River winds its way 3,900 miles through China and terminates near the mega-city of Shanghai. The Yangtze is one of the world’s longest, most powerful rivers. For more than 2,000 years, it has played a key role in Chinese history as a source of drinking water, a crop irrigator, and as a transportation network. Although the Yangtze has supported lives, it has ended many others. In 1931, torrential rains caused the Yangtze to flood its banks, which wiped out crops and lead to the deaths of an estimated 3.7 million people, making it one of the deadliest natural disasters in history. In 1954, another round of flooding resulted in the deaths of more than 30,000 people. In the early 1990s, the Chinese decided to harness the Yangtze with a huge dam. At over 1 mile long and almost 600 feet tall, the Three Gorges Dam is the largest hydroelectric dam on earth. It cost more than $30 billion to build and produces awesome amounts of electric power. It’s also a key part of the Yangtze flood-prevention system. To this day, the Three Gorges Dam stands as a monument to mankind’s ability to harness powerful forces and direct them towards productive means. We’ve harnessed rivers like the Yangtze. We’ve harnessed powerful animals to pull plows and wagons. We’ve harnessed the power of the atom to produce nuclear energy. So as an investor, why should you sit in fear of volatility… instead of joining in mankind’s legacy and harnessing its extraordinary power to build wealth? To most investors, “volatility” is a bad word. It’s like a habanero pepper in your oatmeal. You don’t want to see it in your sensible, conservative investment mix. The talking heads on financial television bemoan volatility. Mainstream headlines make it sound like a terrible thing. And this brings up one of the greatest lessons you can ever learn about the financial markets…. one of the true keys to market mastery. Great investors and speculators treasure volatility. As a professional investor, I love volatility. I owe much of my success to this “dirty word’ of the financial world. In fact, I believe it’s a landmark moment in an investor’s career when he/she realizes that, much like a powerful river, volatility can be harnessed, directed, and used as a tool. When that realization happens, a world of huge opportunities opens. 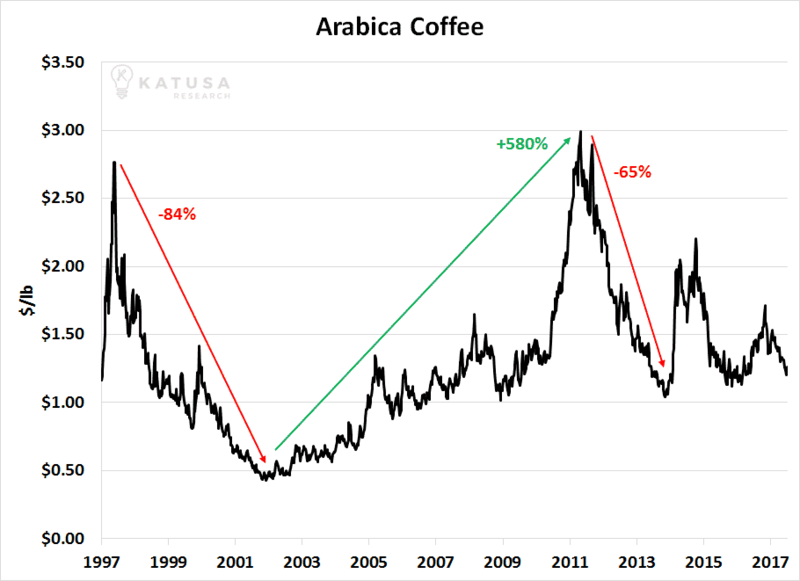 Many of these opportunities will come from the extremely volatile commodities market. If you know how to harness this market’s volatility and put it to work, you can make extraordinary returns in stocks. You can make returns in 10 months that most people wait 10 years to make. 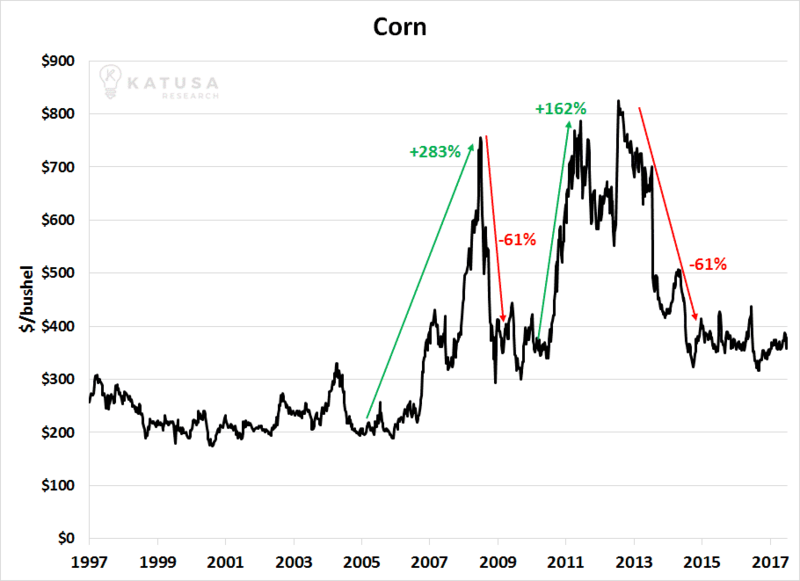 Because more so than any other asset, commodity prices move up and down in huge boom and bust cycles. They exhibit what’s called “extreme cyclicality.” One year, the price of a commodity like oil, silver, or copper can skyrocket 75%. The next year, it can fall 50%. In other words, it can be very volatile. Take crude oil for example. Below is a chart of crude oil’s price movements over a 20-year period starting in 1997. As you can see, one of the defining traits of this market is extreme volatility… the tendency to boom and bust. Volatility isn’t the exception in this market… it’s the rule. Moves of 40%… 50%… and 60% took place in less than 24 months. 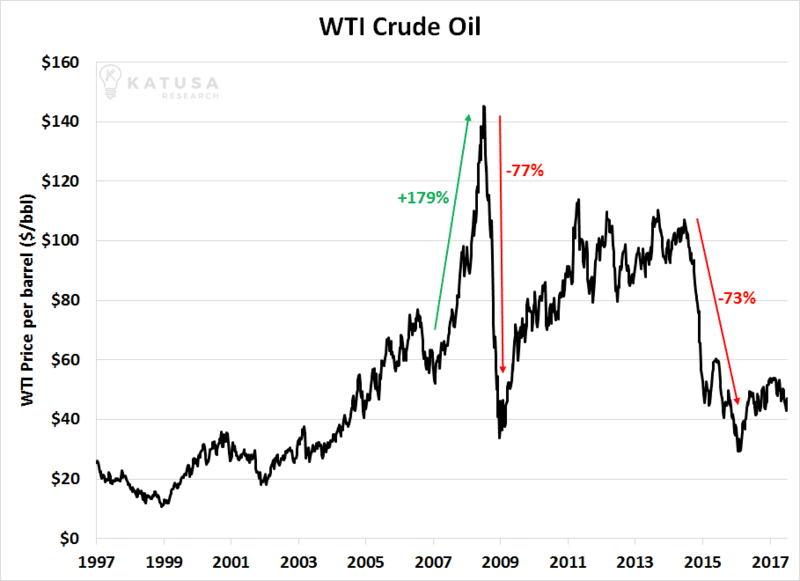 I’m not “cherry picking” crude oil to show you an unusual example. 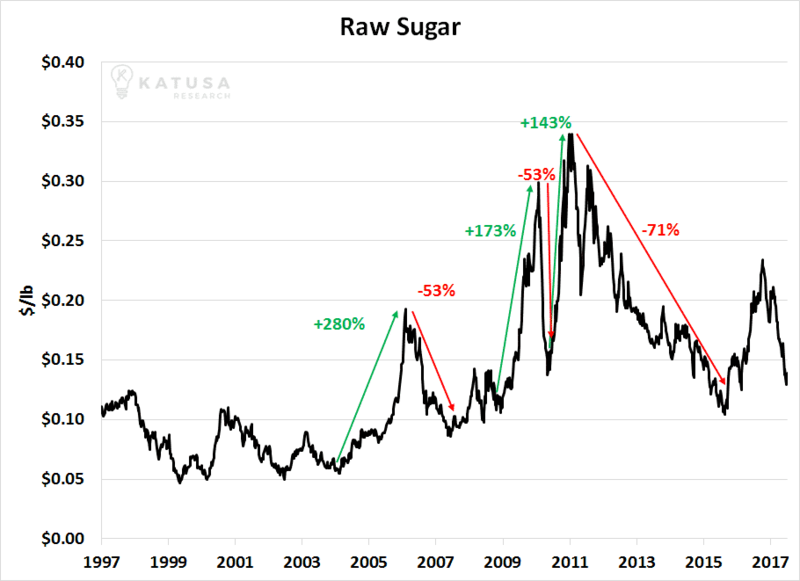 Given their volatile nature, it’s not uncommon for commodity markets to soar hundreds of percent higher in just a few years. Their massive price moves create massive opportunities. 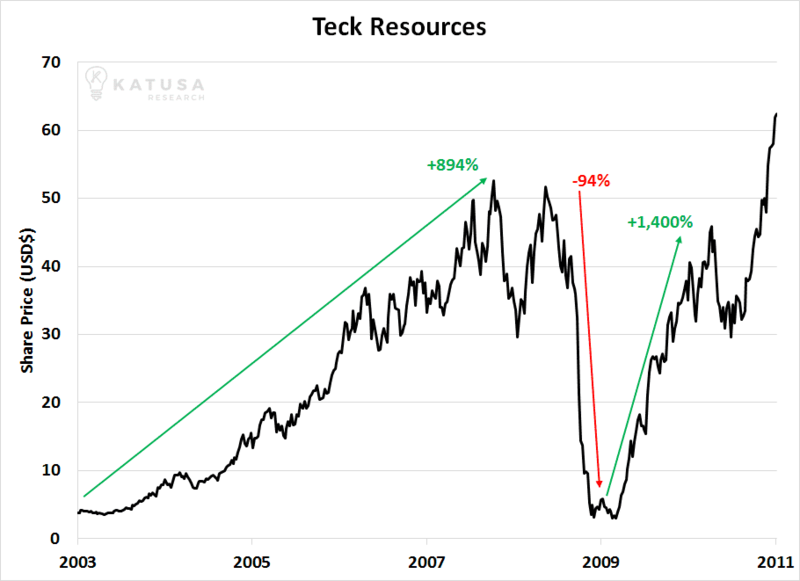 For example, during the 2008-2009 financial crisis, the share price of Canada’s largest diversified miner, Teck Resources, plummeted from CAD$50 per share to under CAD$4. It then soared back to CAD$40 per share and beyond within 12 months (a gain of more than 1,400%). 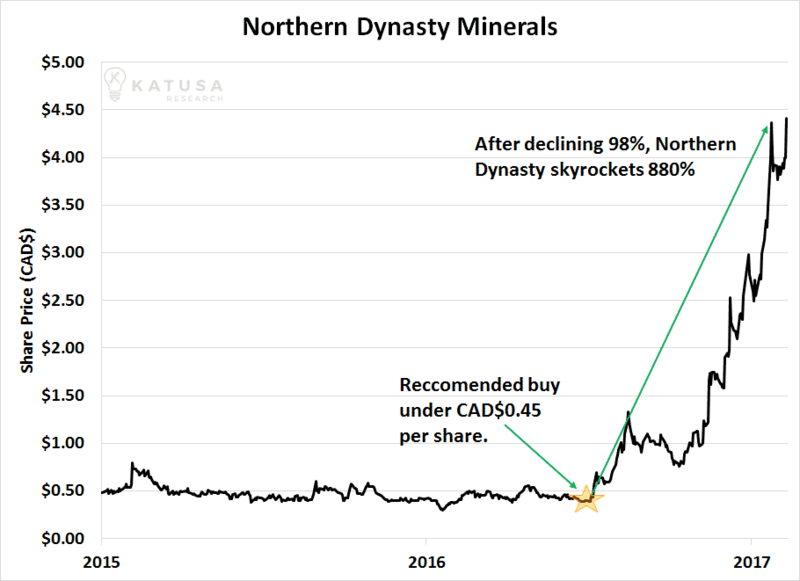 And consider the incredible story of Northern Dynasty, a company I recommended in my premium service, Katusa Resource Opportunities in July 2016. 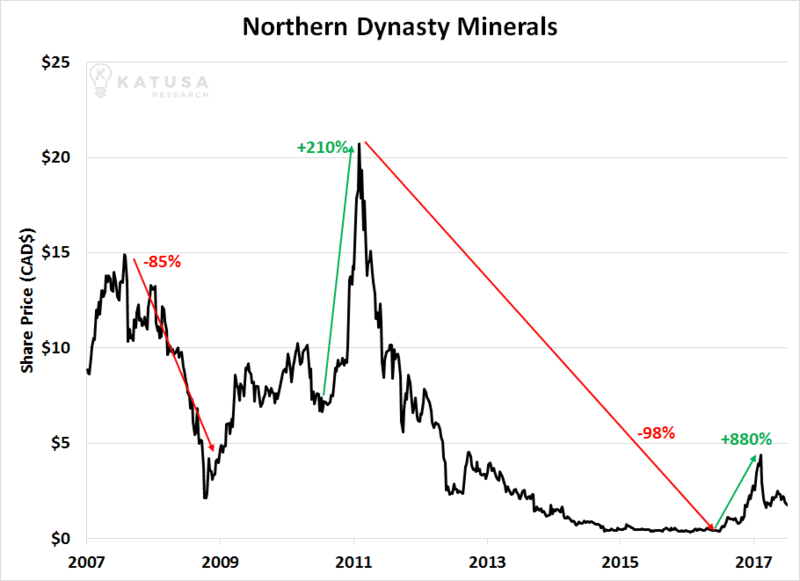 Northern Dynasty is a great case study on how to profit from volatility. Northern Dynasty owns one of the world’s largest undeveloped copper and gold deposits. In 2011, the company was a market darling. 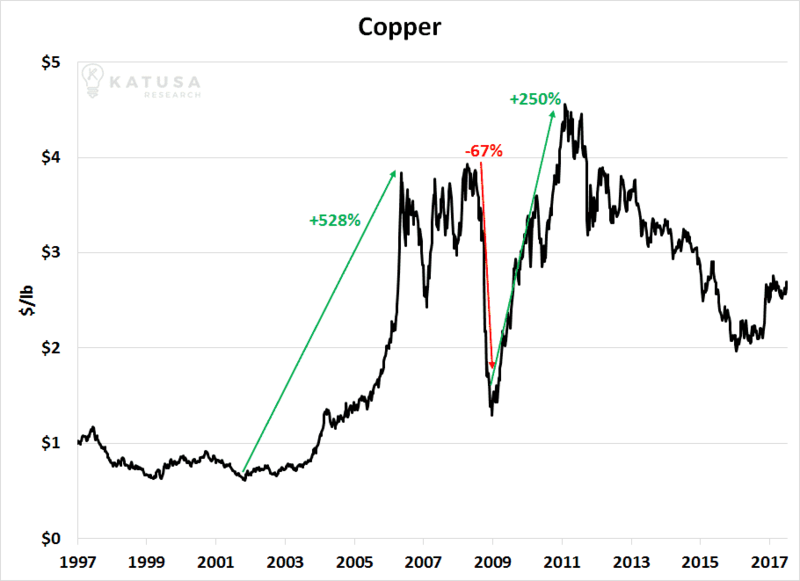 Copper and gold prices were very strong. Northern Dynasty shares soared to over CAD$20 and major mining companies were bidding to get a piece of its project. 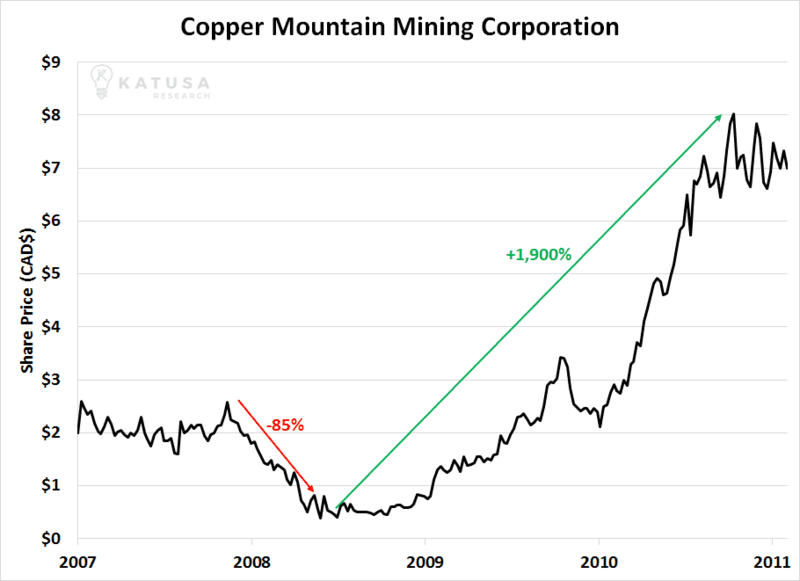 Just five years later, copper and gold prices had suffered big declines. Northern Dynasty lost support from major mining companies and its share price fell below CAD$0.40 per share (a 98% decline in five years). Below is a chart that shows the share price from 2007 to 2017. After I performed a site visit and hundreds of hours of research, I believed things would get a lot better for Northern Dynasty. In July 2016, I recommended the company as a buy under CAD$0.45 per share. Within nine months, the deeply depressed shares soared to CAD$4.40 (a gain of 880%). It’s an incredible story of using volatility to our advantage. Most financial advisors will urge you to avoid volatile markets like the ones I’ve described. I agree with them. Armchair investors have no business trying to navigate these rapids. These folks are best served by regularly buying shares in low-cost index funds, settling for average returns, and getting on with their lives. But what if you’re willing to do extra work to earn extra returns? What if you’re interested in being better than average… like 10 or 50 or 100 times better than average? Well, then you might consider learning how to harness the commodity market’s volatility and using its extraordinary power to generate wealth for you. I could fill a book on how to harness and volatility and profit from it, but I believe that ultimately, you need just three key mental assets to make volatility a wellspring of capital gains for the rest of your life. That’s the nature of a volatile market. And while booms can be great, you must learn to appreciate the busts as well. You need to learn to appreciate a good crisis. That’s when you sow the seeds of big bull market gains. As I state in my educational essay An Investment Secret You Might Not Want to Share With Friends: Markets are rational most of the time. They price most assets correctly most of the time. But when emotion levels go off the charts – like they do in a market crash – emotion completely overwhelms reason. During crashes, terrified investors sell assets with no regard for their underlying values or ability to produce cash flow. This creates an environment where the price of assets becomes “unhinged” from the value of assets. This, of course, means you can buy bargains during a crash. If you can keep a level head while others are losing theirs, you can buy at fire sale prices. When most investors hear about a crash in a market, their instinct is to sell or completely avoid that market. But if you’re interested in profiting from volatility, you must develop an instinct to buy into those kinds of markets. You must learn to run towards crisis. A crisis is about the only time you can buy valuable assets at extreme bargain prices. Asset #2: Ability to ignore the desire to be part of a crowd. Eighty thousand years ago, being part of a crowd helped you survive. Since there is “safety in numbers,” members of pre-historic tribes were less likely to get eaten by predators or killed by rival tribes than those who wandered alone. To this day, being part of family and social groups promotes happiness and longevity. However, in the investment market, your herding instincts work against you. Doing what everyone else does is sure to make you a loser. Said another say, don’t wait in line to buy assets. If you do, you are sure to overpay. Think of how the public piled into tech stocks right before the 2000 crash… or how the public piled into real estate right before the 2007 – 2009 crash. To harness volatility and make it a source of profits, you must learn how to ignore your desire to be part of a crowd. After an asset suffers a bust, nobody wants to buy it. The lack of buyers means asset prices get very cheap. You’ll have little competition to buy the assets. The headlines will be terrible. If you tell the average guy what you’re buying, he’ll look at you like you’re crazy. These are all signs you’re doing the right thing. Buying cheap, hated assets is a lonely endeavor… but it’s extremely rewarding. This might be the most difficult mental asset of all to acquire and put into practice. This is because it’s easy to fall in love with a position that has produced big paper profits for you. Once you learn how to buy extreme bargains during times of crisis, you’re bound to have some massive 100%+ winners in your portfolio. It’s easy to fall in love with a stock that doubles or triples in value. Seeing it in your portfolio will make you feel good. The winning stock can become like the family pet. And who wants to sell the family pet? Extremely cyclical assets like commodities and natural resource stocks should be approached with a “rent, don’t own” mentality. You must be willing to sell these assets after they appreciate in value. It’s only a matter of time before they bust again. Remember, you don’t make money until you sell. Your “pet” is just a piece of paper. Don’t fall in love with it. It won’t love you back. 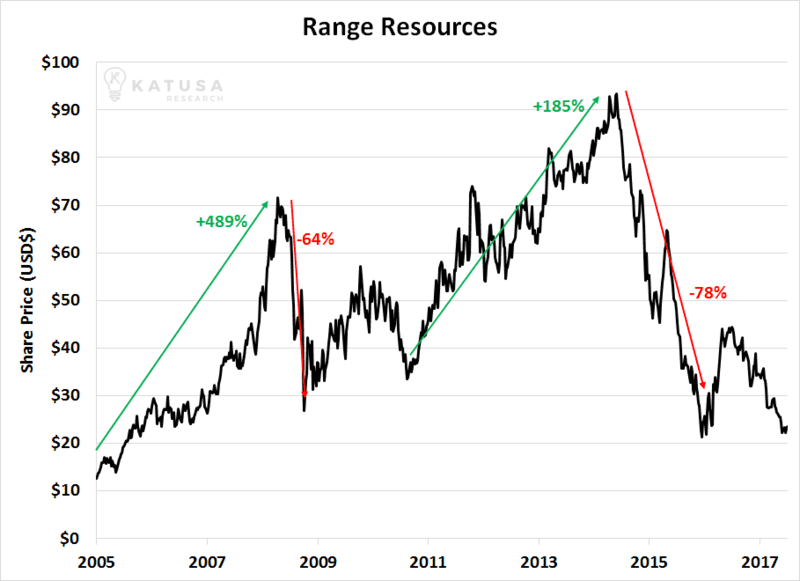 To get an idea of what life can be like for a natural resource stock – and why you should take a “rent, don’t own” approach to them – have a look at this chart of Range Resources from 2005 – 2017. Range is one of North America’s largest natural gas producers. Range shares boomed 489% from 2005 – 2008… then busted 64%. Range shares boomed again from 2011 to 2014, gaining 185%. After that boom, shares fell 78%. 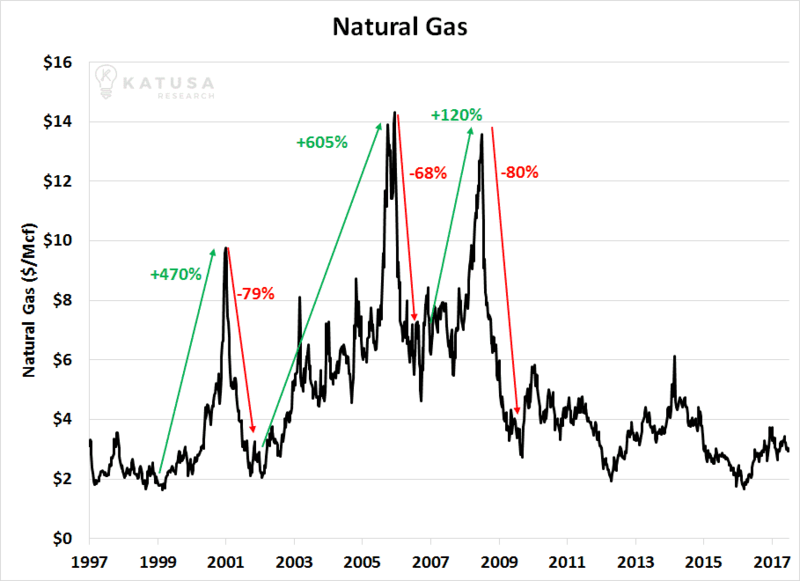 When resource stocks like Range boom, speculators can make big money… but only if they sell. If you’re new to the markets, it’s easy to get scared of volatility. The media certainly makes it out to be a bad thing. But I’ll state again for emphasis: I believe it’s a landmark moment in an investor’s career when he/she realizes that, much like a powerful river, volatility can be harnessed, directed, and used as a tool. When that realization happens, a world of huge opportunities opens. Many of these opportunities will be in the volatile commodity markets. If you learn how to harness this volatility and put it to work, you can make it a source of huge capital gains for years to come.